Most of you reading this will be very familiar with the story of how ocean acidification is likely to impact marine calcifying organisms: increased carbon dioxide in the atmosphere is decreasing the pH of the oceans and is proposed to eventually lead to the dissolution of the shells of organisms made from calcium carbonate. It is difficult to work out in the lab, however, exactly what the impact of ocean acidification will be on marine calcifiers, as time pressures favour experiments that only assess short-term acclimation responses of organisms to ocean acidification (rather than long-term potential adaptations). Even when long term experiments have been carried out, they have only looked at the impact of pH change alone (see here), ignoring other relevent variables such as temperature. A continuous plankton recorder (CPR), via http://www.sahfos.ac.uk/. One of the best ways to look at how organisms will adapt in the real world (to multiple environmental factors) is to use long-term historic data sets, as you can see how organisms adapt to environmental change in the real world. There are few (if any) better long-term historic data sets than that collected by the continuous plankton recorder (CPR) in the North Atlantic Ocean. In a newly published study in Nature Climate Change, scientists used CPR data to look at how the distributions of various groups of calcifying plankton have changed since 1960, and compared these trends to changes in sea-surface temperature and pH. What they found was an increase (in the abundance and spatial distribution) of a number of marine calcifiers (coccolithophores, foraminifera and echinoderm larvae), often accompanied by pole-ward shift in their distribution, but a decrease in several other calcifiers (pteropods and bivalve larvae). The authors found that temperature is the main reason for these changes, with pH playing a significant but less important role. This is probably because temperature has a large influence on the rate of all biological reactions (including calcification), and it is likely that increasing water temperatures are changing the ecological range that calcifying plankton can thrive in. This may be through direct physiological effects on these organisms, or via indirect effects on the predators and/or prey of these organisms. There is an important caveat though: just because temperature currently seems to be a more important driver of calcifying plankton distributions than pH, does not mean it will always be this way: it is likely that calcifiers (especially those made from the less soluble calcite form) will be unaffected by decreasing pH for a number of decades — species formed from the more soluble aragonite form of calcium carbonate may not be so lucky (see here). The study also did not look into how shell masses of calcifying plankton have changed since 1960 (it couldn’t, as only species abundances can be obtained from CPR data), but it may be that they are lighter now than they were then, and therefore these organisms may be creeping closer to ecological collapse in some parts of the ocean. The take home message though, is that the distribution of marine calcifiers in the ocean can be influenced, not just by pH, but by changes in ocean temperature. 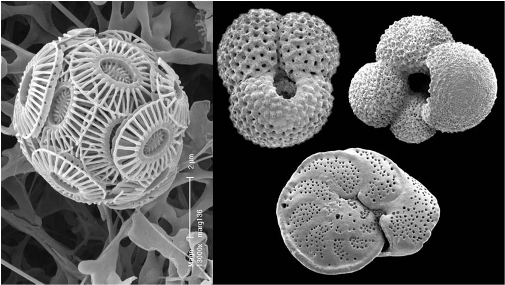 Scientists need to consider both of these factors (and possibly others) when trying to assess how calcifying plankton will respond to global environmental change.